So much time have passed, so many achievements, I wish all customers all the best for 2019! All products advertised here are available, I am open for new startup proposals. If you need your own special software, impossible to find elsewhere, here is the chance. I am working fast with reasonable prices, and have experience in a lot of domains and hardware platforms, from small microcontrollers to Smartphone, PDA, desktop and server PC. Interested? Contact me for a talk! This is a loadable extension for PHP running on Windows implementing serial port handling and communications. Once installed in PHP environment you can programm PHP applications to control serial device hosted on server from remote location; these devices can be anything from video switcher, cameras pan/tilt, ham radios, media players, home automation boxes, GSM modems/terminals (send/receive SMS), only your imagination and needs are the limits. rsterm is an easy to use serial terminal software built to speed up development or activities involving GSM modems, using standardized and custom AT commands. Special serial port handling controls are provided, and a big number of buttons to send individual AT commands to the modem, without the need to type them. Of course a terminal window is provided to see and inspect modem answers or type commands manually. Easy Control is a script engine intended to build small to medium Windows application targeted to serial communication (that talk with devices connected to PC serial ports ) and TCP/IP communications. Application examples can be human interfaces for serial devices like microcontroller boards, ham radios, alarms, sound systems. 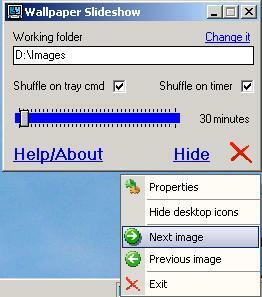 General purpose Windows application can be easyly built too. The script language is Basic like, typeless, very easy to learn and use. 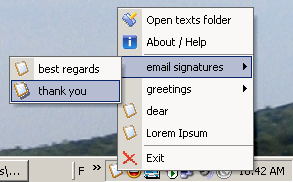 Features a built-in editor with coloring syntax hilighting, autocompletition and parameter hints. Windows GUI interfaces for applications can be built the free Rack Designer application (see below) which include a nice set of controls from analog voltmeters buttons, sliders, LCDs to a scope like display, with input, output or just for design purpose. Applications can be built to run standalone, royalty free ! Ezcom2web is a lightweight HTTP server and a script engine (like PHP or ASP) in one application . It is a very good tool to control a device connected on a remote PC serial port . In your web browser ! You can build a complete web interface for your RS232 device, for example for a home automation box, a remote camera, a ham radio. More power can be obtained with the integration of the PHP (cgi version) script engine. Quick Texts is an utility to speed up your editing process when using a lot of Copy & Paste operations of same texts. If you have to copy & paste during a day same texts like email signatures or standard answers, links, quotes, source code ... any text, you'll save a lot of time using this handy utility. GPSGate.com Blackberry tracking client application. Small utility for displaying your photos on of your desktop wallpaper in a cycling manner. 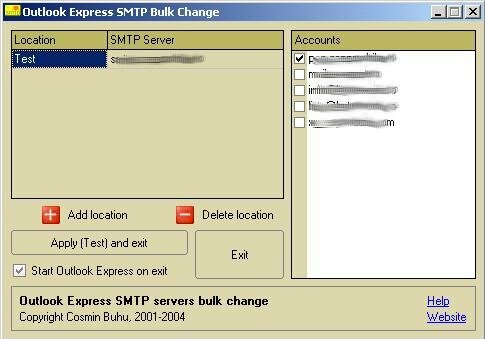 Small utility to quickly change SMTP server in all or a subset of Outlook Express e-mail accounts. Easy to use tool for building Windows GUI (Graphic User Interfaces) for Easy Control script engine. With many controls available, and with its ease of use, you can build fast nice looking virtual instruments in minutes.